Traumatic optic neuropathy (TON) is a potentially blinding complication of head trauma. Indirect damage to optic nerve due to transmission of concussive forces following cranial trauma is the most common form of TON occurring in about 1%–5% of all cases of closed head trauma., On the other hand, direct optic nerve injuries are rare and are caused by sharp penetrating objects that enter the orbit. There is no conclusive evidence for a standardized treatment protocol for this blinding condition., Conservative anti-inflammatory oral treatment, intravenous (IV) or oral corticosteroids, decompression surgeries have all been advocated, but still the evidence base for these various treatment options are weak. We aim to analyze the clinical profile and visual outcome in TON patients. Ethical approval was granted by the Institutional Review Board of Aravind eye care system. A retrospective study was carried out on 56 patients with TON who attended Aravind eye hospital, Pondicherry from January 2014 to December 2016. Demographic and clinical variables were collected for all the patients. Patients with preexisting ocular abnormalities that might affect visual function were excluded from the study. All enrolled cases had a complete ocular examination including best-corrected visual acuity, intraocular pressure measurement, pupil assessment for relative afferent pupillary defect (RAPD), ocular motility, and fundus examination. All these tests were repeated after 1 week and 1 month. All these patients underwent computed tomography (CT) scans (axial and coronal) of orbit and brain. Visual acuity was measured using Snellen chart. Forty-four out of 56 patients were treated with methylprednisolone. A written informed consent was taken before starting of treatment. Base-line electrocardiogram and blood sugar level were done. Pulse and blood pressure recorded before infusion and monitored using pulse oximetry. IV methylprednisolone 1 g was given (diluted in 100 ml normal saline over 45 min) for 3 days. Then, oral prednisolone 1 mg/kg in tapering dose was administered for 2 weeks. Patients were examined every day during hospitalization and later at 1st week, 2nd week, and 1 month. Twelve patients were managed conservatively due to reasons including delayed presentation (9 patients), uncontrolled diabetes (two patients) and extensive subarachnoid hemorrhage (1 patient). Results on continuous measurements are presented as mean ± standard deviation (Mi-Max) and results on categorical measurements are presented as frequency (percentage). Mann–Whitney U-test and the Wilcoxon signed-rank test have been used to find if there is any significant difference between baseline and month 1 vision in treated and untreated groups. A value of P < 0.05 is considered statistically significant. The data of 56 patients were analyzed. Fifty-four patients had an indirect optic nerve injury, and two had direct penetrating optic nerve injury causing partial avulsion of the optic nerve. Fifty-four were male and two were female. The age group involved was predominantly 14–35 years with a mean age of 32.5. The major causes of trauma were road traffic accidents (RTA) (88%). Most of the patients were healthy (82%), and few had diabetes (3.5%), hypertension (5.3%), and ischemic heart disease (1.7%). 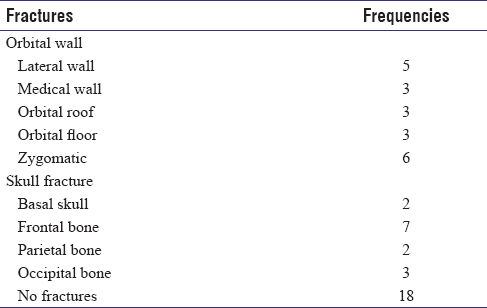 Forty-seven out of 56 patients had poor visual acuity (≤6/60) on presentation [Table 1]. 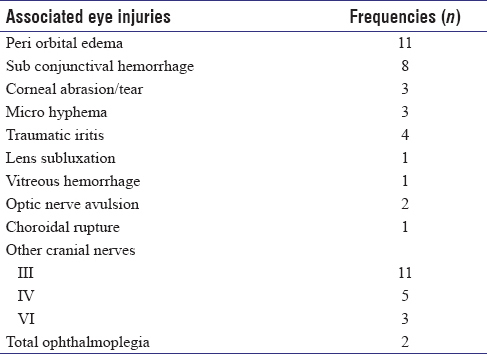 Associated findings such as extraocular palsies, orbit, and skull fractures are given in [Table 2] and [Table 3]. CT of the brain and orbit revealed intracranial bleed in 9 patients of which two had extensive subarachnoid hemorrhage. 38 (67.85%) patients had one to multiple orbital and or skull fractures, of which only one patient had displaced orbital wall fracture impinging on the optic nerve. Eighteen (32.15%) patients had no fractures. A total of 10 patients had normal visual fields on Bjerrums field test. Thirteen had generalized constriction, two patients had hemianopic defect and one had an altitudinal defect. Visual fields could not be assessed in patients with very poor visual acuity. RAPD was seen in all patients. Forty-four out of 56 patients were treated with IV steroids-1 g of IV methylprednisolone for 3 days followed by 1 mg/kg oral prednisolone in tapering dose over 2 weeks. Twelve patients were managed conservatively due to reasons mentioned above. Of the 12 patients managed conservatively, no significant improvement was seen. Visual acuity recorded during various assessment times for treated and untreated groups are depicted in [Figure 1]. 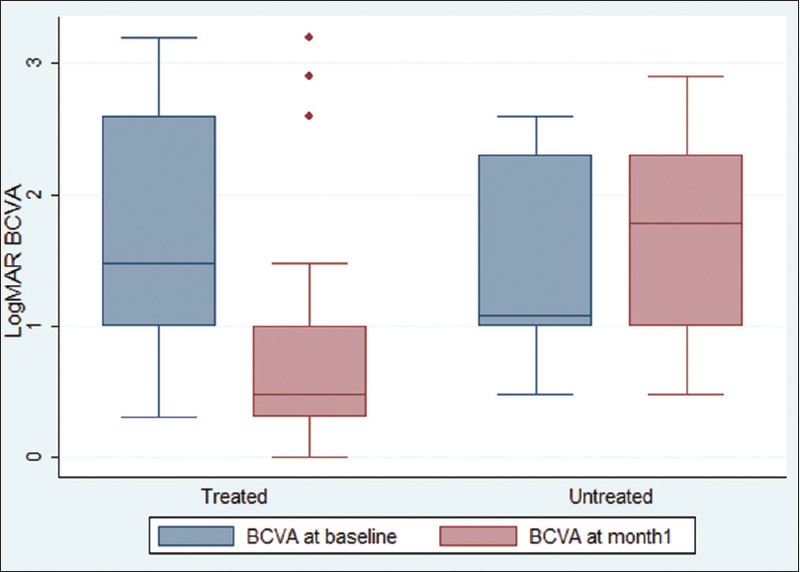 In the treatment group, 25 of the 44 (56.8%) patients had >2 line improvement in visual acuity. A total of 12 patients had >1 line improvement, 6 patients did not improve and 1 patient worsened in spite of treatment. All 6 patients who did not improve presented with a baseline vision of <6/60 [Table 4] and [Table 5]. The majority (51 of 56) of the patients did not show improvement in fields at 1 month follow-up irrespective of treatment or observation and in spite of improvement in visual acuity in 37 patients. TON is an ophthalmic emergency and occurs in the setting of head injury either after RTA or accidental falls or violence. Treatment for this devastating cause of vision loss is not yet standardized. Some ophthalmologists prefer supportive treatment, while others choose to intervene with IV steroids, surgical decompression of the optic canal or both. The evidence base for these various treatment options is weak, and the interventions are not without any attendant risks. Here, we have performed a retrospective analysis of 56 consecutive TON patients to understand the visual outcome with and without intervention. 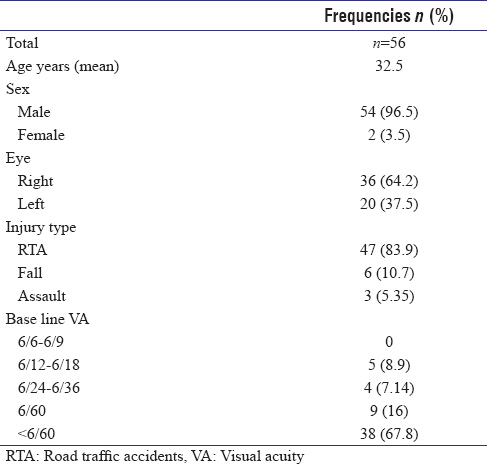 The most common cause of TON was RTA (88%), young males (15–35) were the predominant victims (96%) which were similar to earlier studies., Associated skull, orbital and eye involvement varied depending on the severity and type of injury. Periorbital edema and subconjunctival hemorrhage were the most commonly associated eye injuries. Partial optic nerve avulsion was seen in two patients with direct penetrating optic nerve injury. Cranial nerve palsies were seen in 19 patients. Complete ophthalmoplegia was seen in 2 patients. In contrast to previous studies  association of skull fractures did not significantly alter the final visual outcome except in direct impingement of optic nerve. Steroids treatment in TON has been greatly influenced by the National Acute Spinal Cord Injury Study that concluded that megadose steroids used within 8 h of injury showed better neurological outcomes.,, However, this result was in contrast with higher mortality associated with megadose steroids in corticosteroid randomization after significant head injury study (CRASH)., Based on the initial daily dose of methylprednisolone used, steroid regimens can be classified as: (1) low dose (<100 mg), (2) moderate dose (100-499 mg), (3) high dose (500–1999 mg), (4) very high dose (2000-5399 mg), or (5) mega dose (>5400 mg). In our study, due to controversies about megadose steroids as seen in CRASH trial, we instead followed a high dose regimen  as similar to optic neuritis treatment trial (ONTT) (1 g of IV methylprednisolone for 3 days followed by 1 mg/kg oral prednisolone in tapering dose over 2 weeks). In our study that includes 56 patients, 12 were untreated and 44 received corticosteroids. The results of statistically significant visual improvement were 0% in the untreated group and 56.8% in the treated group. Similar results were seen in a study by Chou et al., who concluded that the patients in the treated groups did statistically better than the untreated patients. The major predictor of prognosis was the presenting visual acuity. As in previous studies, patients with poor visual acuity (<6/60) at presentation had a poorer prognosis.,,, In this study population, when the patient developed late-onset defective vision few days following trauma, they showed rapid visual recovery following treatment. Four patients in our study developed defective vision ≥5 days following trauma and all 4 had >2 line improvement by the second day of treatment. This is probably because defective vision is the result of posttraumatic inflammation rather than traumatic structural damage. In such patients, duration of defective vision is more important than the duration of the posttrauma period. Maximum improvement occurred immediately after treatment. No significant improvement was observed beyond 1 month. Continuing oral tapering dose of steroids did not have any role in patients who showed nil improvement with IV steroids. In spite of significant improvement in visual acuity, the field of vision did not improve in the majority of the patients (91.6%) at 1-month follow-up. No major adverse effects were encountered in our patients. Four (9%) patients had raised blood sugars that were controlled with insulin injection. Four (9%) patients developed mild self-limiting skin rashes that did not require any specific treatment. Two patients (4.5%) had raised intraocular pressure (30 and 36 mm of Hg, respectively) which was controlled with topical beta-blockers. None of these side effects warranted interruption of treatment. This being a retrospective study has its inherent limitations. Treated and untreated patients are not equivalent. For similar reasons, the International Optic Nerve Trauma Study, undertaken to formulate an optimal management protocol failed because of the limited number of eligible patients  and ethical considerations. Authors of this study do not intend to compare the treated and untreated groups but observe that the outcomes in treated group are significantly favorable thus emphazising that deferring treatment in TON should be reconsidered in patients presenting within 72 h of onset of defective vision following trauma. Regimen of IV methyl prednisolone as proposed by ONTT (1 g/day for 3 days followed by oral tapering steroids 1 mg/kg for 2 weeks) is safe and effective in managing TON patients presenting within 3 days of onset of defective vision following trauma even with presenting visual acuity as low as 6/60. Those with baseline vision <6/60 and those managed conservatively did not show statistically significant improvement. No major side effects were encountered with the above-stated regimen. The authors would like to acknowledge the work of Mr. Mohammed Sithique, chief statistician, Aravind eye care system for his support. Sarkies N. Traumatic optic neuropathy. Eye (Lond) 2004;18:1122-5. Steinsapir KD, Goldberg RA. Traumatic optic neuropathy. Surv Ophthalmol 1994;38:487-518. Yu-Wai-Man P, Griffiths PG. Surgery for traumatic optic neuropathy. Cochrane Database Syst Rev 2005:CD005024. Yu-Wai-Man P, Griffiths PG. Steroids for traumatic optic neuropathy. Cochrane Database Syst Rev 2011:CD006032. doi: 10.1002/14651858.CD006032.pub4. Pirouzmand F. Epidemiological trends of traumatic optic nerve injuries in the largest Canadian adult trauma center. J Craniofac Surg 2012;23:516-20. Lee V, Ford RL, Xing W, Bunce C, Foot B. Surveillance of traumatic optic neuropathy in the UK. Eye (Lond) 2010;24:240-50. Wang BH, Robertson BC, Girotto JA, Liem A, Miller NR, Iliff N, et al. Traumatic optic neuropathy: A review of 61 patients. Plast Reconstr Surg 2001;107:1655-64. Bracken MB, Shepard MJ, Collins WF, Holford TR, Young W, Baskin DS, et al. Arandomized, controlled trial of methylprednisolone or naloxone in the treatment of acute spinal-cord injury. Results of the second National Acute Spinal Cord Injury Study. N Engl J Med 1990;322:1405-11. Bracken MB, Shepard MJ, Holford TR, Leo-Summers L, Aldrich EF, Fazl M, et al. Administration of methylprednisolone for 24 or 48 hours or tirilazad mesylate for 48 hours in the treatment of acute spinal cord injury. Results of the Third National Acute Spinal Cord Injury Randomized Controlled Trial. National Acute Spinal Cord Injury study. JAMA 1997;277:1597-604. Spoor TC, Hartel WC, Lensink DB, Wilkinson MJ. Treatment of traumatic optic neuropathy with corticosteroids. Am J Ophthalmol 1990;110:665-9. Edwards P, Arango M, Balica L, Cottingham R, El-Sayed H, Farrell B, et al. Final results of MRC CRASH, a randomised placebo-controlled trial of intravenous corticosteroid in adults with head injury-outcomes at 6 months. Lancet 2005;365:1957-9. Yu-Wai-Man P, Griffiths PG. Steroids for traumatic optic neuropathy. Cochrane Database Syst Rev 2013;6:CD006032. Volpe NJ, Levin LA. How should patients with indirect traumatic optic neuropathy be treated? J Neuroophthalmol 2011;31:169-74. Chou PI, Sadun AA, Chen YC, Su WY, Lin SZ, Lee CC. Clinical experiences in the management of traumatic optic neuropathy 1996;16:325-36. Cook MW, Levin LA, Joseph MP, Pinczower EF. Traumatic optic neuropathy. A meta-analysis. Arch Otolaryngol Head Neck Surg 1996;122:389-92. Seiff SR. High dose corticosteroids for treatment of vision loss due to indirect injury to the optic nerve. Ophthalmic Surg Lasers 1990;21:389-95. Steinsapir KD. Treatment of traumatic optic neuropathy with high-dose corticosteroid. J Neuroophthalmol 2006;26:65-7. Carta A, Ferrigno L, Salvo M, Bianchi-Marzoli S, Boschi A, Carta F, et al. Visual prognosis after indirect traumatic optic neuropathy. J Neurol Neurosurg Psychiatry 2003;74:246-8. Sundeep, Niveditha H, Nikhil N, Vinutha BV. Visual outcome of traumatic optic neuropathy in patients treated with intravenous methylpredisolone. Int J Sci Stud 2014;2:67-70. Levin LA, Beck RW, Joseph MP, Seiff S, Kraker R. The treatment of traumatic optic neuropathy: The international optic nerve trauma study. Ophthalmology 1999;106:1268-77.